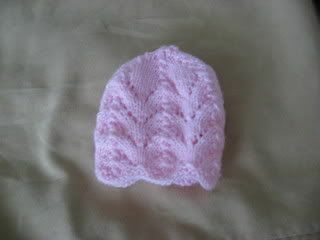 In my continuing efforts to shirk housework add to the national preemie hat supply, I made two hats today. So I finished that one, did the dishes (again), rotated the laundry (again), set the Scooba washing the kitchen floor (again) and found myself contemplating what if (again) (it was apparently déjà vu day in the Den today). What would this hat look like (I asked myself, firmly ignoring the small voice inside my head that said if I didn’t get clean sheets back on all the beds before bedtime I would be very much upset with myself later) if I made it more…flower-ish? And did it in the round instead of back-n-forth? On smaller needles? Say, switched to green at the crown and maybe did an i-cord at the top like a stem? I intentionally made the stem on the short side to make it harder for Baby to accidentally get hold of it and pull off the hat, or choke on it. It amuses me far more than it has any right to do. But then, I’m still lusting to make the tulip toes booties from Knitty’s Summer 2006 issue. So perhaps it is possible I have some kind of ‘flower’ thing going. I LUUURRRVE that hat! Very clever. The hat is genius...the doll is creepy. 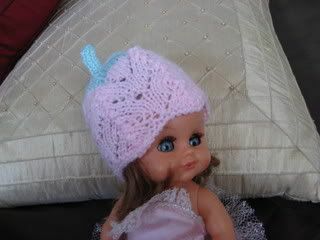 Love the hat, but I have to agree with Renee - the doll gives me the willies. Reminds me of my sister's Mrs. Beezley doll from the 70's (okay, yes, I'm old) - the thing WATCHED you everywhere you went. Creepy. But the hat is sure cute! I am lusting after the Tulip Toes, myself. I thought I was golden - my brother and his wife are expecting in September. But they too have done me wrong; they are having a boy (as my sister did in February)! 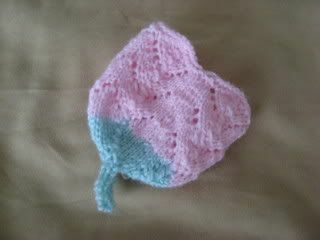 I do knit basic hats and booties for charity, but the really adorable stuff that I desperately want to knit, I must give to someone I know, so I can see it on the baby now and then. Is that selfish?